Learn how to add an assignment category in ATLAS Gradebook. It’s good to remember as we discuss assignment categories that ATLAS Gradebook is a pliable tool. So, I’m going to show you one way to get a desired result – but there may be another way to accomplish the same task, and what it’s really about is the result. So, let’s approach this as an example of one way to set up your assignment categories! Let’s take a look at the Assignment Category screen for a given Course Term. This particular screen doesn’t have any entries in it yet. To get started, click the Add Assignment Category button. Clicking there will prompt the dialog box below to open in your window. We can see that the only mandatory field is Name, and I’ve decided to have this be the assignment category for my quizzes. 1. 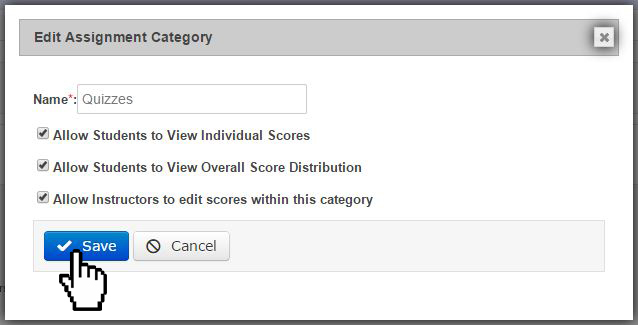 “Allow Students to View Individual Scores” – allows students to view scores for assignments within assignment category. 2. “Allow Students to View Overall Score Distribution” – shows student their score in relation to the overall distribution of scores. 3. “Allow Instructors to edit scores within this category” – enables instructor entering and editing of grades for assignments within this assignment category. I now have the option to either Save my new Assignment Category or Cancel it. I’ll chose Save so that we can see what the assignment category looks like in the table. Now we can see our “Quizzes” Assignment Category in the table. There we also see the checkboxes that we had the option of selecting. I just have click the “edit” button to view/edit the details of the assignment category. We see that the box is the same as when we went to add the assignment category. This time I’ll go ahead and select the “Allow Students to View Overall Score Distribution” and hit Save. We can now see that all of our desired checkboxes appear selected.